This entry was posted in Dietgirl 11th Birthday Sell Out by shauna. Bookmark the permalink. This has to be the BEST prize yet, yum,yum,yum! I need something to restore my Zest as I’m off sick with torn ankle ligaments…. Sounds so versatile I could probably rub it on my ankle! Dear Total,and Zest I may not have the body of a Greek Goddess” but with the help of a months supply of the deliciously smooth and rich total I hope to shed the pounds like an Olympian..
Ps Your simply the Zest, Better than all the Zest Better than any one, anyone ive ever zest..
Yum yum yum! It’s also lovely on porridge. OMFG! I will be saying a wee prayer to the Gods of Random Number Generators tonight in the hopes it will be me. I eat the 2% version every day. I put dried sour cherries in it and leave them to plump up overnight… MMMMMM…. oh my goodness this is such an AWESOME prize! i don’t play the lottery so maybe my lucky numbers are here instead?! 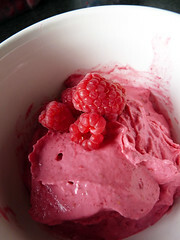 I fell in love with Fage when I first made the instant frozen yoghurt recipe-YUM! oooh yes pretty pretty please! Ooooh, yes please! I love nothing more than some 0% and sweetener and fruit as my dessert. A months’ worth would be greatly appreciated in this house! What a great prize – I’m keeping my fingers crossed! I don’t think anything can beat Greek yogurt! What a fab prize, two of my favourite things! My only question is whether I *have* to spread it out over the month or if I can have a few days of giant dairy-splurging and just pretend it lasted a month? Well, darn! I’m in “The States” and I am on a Greek yogurt kick. My favourite things as well. Yammy. Greek yoghurt and honey go together like Casey Stoner and Honda – the perfect combination! My mouth is watering at the thought of that great prize. Oh me please please please! I have been reading (and loving) your blog for a couple of years now and even served you once in a shop in Edinburgh, but have been too shy to say hello – well no more! The thought of Greek Yoghurt and a Magazine subscription has brought out my courageous side and brought me out of hiding. Pick me RNG! Love greek yogurt! Would really help with the healthy lifestyle i am trying to live!! Well, I lost 8 stone after a gastric bypass, and what with the pre-op milk diet and lactose intolerance afterwards, I haven’t had yogurt for a really long time. You’ve made it sound so yummy I’m going to get some even if I’m not randomly generated. LOVE. LOVE. LOVE this yogurt! Alas, I’m in the U.S. so I can’t enter. Just had to comment because I love it do much, and I almost got turned off of Greek yogurt before I tried this one. Yummy! If I win, I’ll post some up to Scotland for you! Currently suffering with an extremely painful tooth root abscess with further tooth surgery looming in the near future. Yoghurt is about all I can eat so I would get through this lot in record time and I’m sure it would bring a smile to my hideously swollen face! I’m in for this along with my SIL (and bro) who live in London. I simply LOVE Total Greek yoghurt! How can a zero fat Yoghurt taste so thick and creamy?! It lasts for ages and is totally versatile! I’ve used it in sweet and savoury dishes at all times of day. Fingers crossed I’m lucky and win this, I’m making a great effort to lose weight and lead a healthier lifestyle this year! This is a great giveaway. I would love to win. I love this stuff! I used to buy it in the US at Trader Joe’s where it was a more reasonable price. Here in the UK it’s a bit pricey but so worth it as a treat. So good that I do worry that someday we will find out it’s not actually fat free just like that Seinfeld episode…. Love ur blog and ur honesty would love to win the prize total greek rocks! Yum! I love this in chocolate and raspberry smoothies. I use a teaspoon of Green & Black’s Cocoa powder – I first tried this stuff on a Dietgirl recommendation! Doubly good give away, two of my favourite things. Would love to be picked. I make tzatziki with this yogurt and it is mind-blowing! OOOOO This looks so yummy!!!! I adore Total yogurt, so versatile and so healthy too! Yes please, I loveeeeeeee Greek yoghurt 🙂 I’ve never been able to find the split pots around here either so it would be lovely to get the chance to try those as well. I only love one thing more than Total Greek Yoghurt… it’s reading Zest magazine!!! So excited about posting this comment, so want to win… PICK ME ME ME! It’s the only yoghurt I like. I love Total yoghurt, started using it in place of sour cream a good while ago, but now use it for loads of other things as well, yummy. I’d love to enter for a chance to win please, thanks. I was stung by bee! Booo again. We have this brand in the US too although I’m not sure about the magazine. I was totally excited about a 3-month supply! Thanks for entering folks! The Sell Out is now closed.